Home / News, Other Political News / RUTO’s man, OSCAR SUDI,calls MURATHE a Prostitute as 2022 politics get hot. 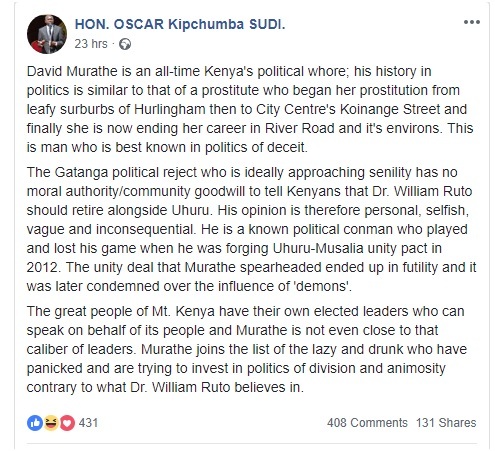 RUTO’s man, OSCAR SUDI,calls MURATHE a Prostitute as 2022 politics get hot. 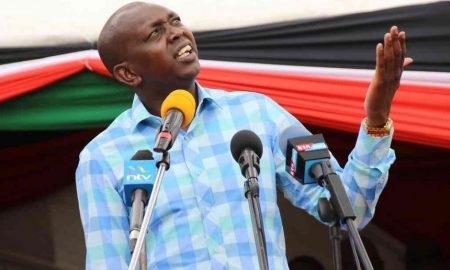 Friday, December 28, 2018-Kapseret Member of Parliament, Oscar Sudi, has lashed out at Jubilee Party Vice Chairman, David Murathe, after he said that Kikuyus owe Ruto no political debt in 2022 and told him to retire with President Uhuru Kenyatta. Sudi,who is one of Ruto’s attack dogs, compared Murathe to a prostitute and painted him as a washed up political broker. According to Sudi, Murathe thrives on politics of deceit and ethnicity. “David Murathe is an all-time Kenya's political whore; his history in politics is similar to that of a prostitute who began her prostitution from leafy surburbs of Hurlingham then to City Centre's Koinange Street and finally she is now ending her career in River Road and it's environs. This is man who is best known in politics of deceit. The Gatanga political reject who is ideally approaching senility has no moral authority/community goodwill to tell Kenyans that Dr. William Ruto should retire alongside Uhuru. His opinion is therefore personal, selfish, vague and inconsequential. He is a known political conman who played and lost his game when he was forging Uhuru-Musalia unity pact in 2012. The unity deal that Murathe spearheaded ended up in futility and it was later condemned over the influence of 'demons'. The great people of Mt. Kenya have their own elected leaders who can speak on behalf of its people and Murathe is not even close to that caliber of leaders. Murathe joins the list of the lazy and drunk who have panicked and are trying to invest in politics of division and animosity contrary to what Dr. William Ruto believes in.” Sudi posted on his official facebook page.